After mastering sagittal plane hip opening, we can now move on to the coronal plane (a.k.a. the frontal plane). If you remember, movements in the coronal plane are basically from side to side. The major coronal plane movements of the hips are abduction and adduction. Most yoga poses for coronal plane hip opening will focus on the inside of the hip or the hip adductor muscles: pectineus, adductor longus, adductor brevis, adductor magnus, and gracilis. 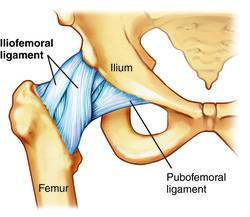 These muscles attach from the pubic area to the inside of your big thigh bone, the femur. The adductors work as a group to pull your thighs closer to the midline of your body creating adduction at the hip joints, so to open or stretch them, we would need to use the opposite motion, abduction. A touch of external rotation also helps. Deeper opening, like in yin yoga, for the coronal plane may start to stretch the iliofemoral ligaments, but we can save that discussion for another time. Check out the muscular anatomy below. Similar to how we don't put as much focus on opening the back of the hips in the sagittal plane, we don't focus as much on opening the outside of the hips in the coronal plane. The muscles on the outside of the hips are the hip abductors: mainly gluteus medius, gluteus minimus, and some of the gluteus maximus and tensor fasciae latae (TFL). Most of these muscles are generally a little under-used and weak in people, so we typically don't try to stretch them out more. The function of the TFL is a bit more complex sometimes making it tight, so it does help to give it a stretch sometimes. Poses that abduct the hips will open the insides of the thighs or the adductors. These poses involve a lot of pulling your thighs away from each other or pulling one thigh away from the center of your body. Horizontal abduction is often seen too. Some examples are below. Opening the hips in the coronal plane will help prepare for poses that need more length in the adductors or poses that need strong hip abduction. Some examples include Tittibhasana (firefly pose), samakonasana (middle splits), eka pada galavasana (flying pigeon/squirrel), and visvamistrasana (Visvamitra's pose). Anatomy images from Thieme Atlas and Textbook of Human Anatomy General Anatomy and Musculoskeletal System, and yoga pose photos from yogajournal.com. Goddess pose photo from lovemyyoga.com. Hi! Some hip opening poses into abduction can definitely work the gluteal muscles. With the correct resistance you can gain some mass in those muscles. Best of luck!